Two Morrows Tahoe Cabin near skiing & HOA beach, pets & children welcome! Koselig; while this Norwegian adjective may be new to you, the meaning isn't – it describes the ambiance invoked by a flickering fireplace, the smell of cinnamon rolls, a glass of California red, and 'Two Morrows Tahoe Cabin,' a 3-bedroom, 2-bath vacation rental that sleeps up to 8 excluding children 5 years of age or younger. Here, you will find that the comforts of home with the desirable amenities. Whether you're spending summer at Lake Tahoe or enjoying the snow at Homewood Mountain Resort or at Sugar Pine Point’s x-c trails, velkommen og kos deg! 'Two Morrows Tahoe Cabin' warmly welcomes you! Our remotely controlled thermostat guarantees the cabin will be cozy when you arrive! If you are a winter guest, feel free to hone your scouting skills and fire up our wood-burning stove to warm fingers and toes while choosing between a hot cup of cocoa or a glass of wine after a great day on the slopes and before indulging in a board game with the family, or settling back to watch a favorite old movie on our Smart TV equipped for sites such as Netflix and Hulu. (Bring your account information and passwords!) Summer guests can enjoy a tall one after a day on the beach while preparing a homemade meal in the fully equipped kitchen and gathering around the picnic-style dining table, or enjoying the meal al fresco on either the front or back deck, toasting to a well-spent vacation day. Bring along your wheeled cart to hall your gear to the beach, because there is no guest parking there! Lake Tahoe has so much to offer in every season! Strolling around our neighborhood with your four-legged family member or throwing on your swimsuit for a dip our community's private beach are popular summer activities. Stop by for dinner at West Side Pizza, or for a sweet treat at Where We Met Gelato & Espresso Bar, both just a short walk away! At day's end, savor the quiet while sipping a drink on our fenced back deck. Follow this with a refreshing shower in a toasty warm bathroom before bidding good night. (Both bathrooms have wall heaters.) The master bedroom is equipped for small families, with a queen bed and stacked bunk beds. Additional guests will sleep comfortably in one of the other two bedrooms or in the living room. Our cabin sleeps eight, not counting children under the age of five, so there are actually beds for up to eleven. We have been listed on VRBO since 2002. Our Vacation Home Rental Permit number issued by El Dorado County is 0192. Hi, I am Roberta and I live north of Seattle. For many years, I served on the Board of Directors of our Tahoe Cedars Property Owners Association. I started and edited the organization's newsletter, the Tahoma Tattler. I lived in San Francisco and worked as a technical writer and editor at Levi Strauss and Co. there. I am now retired, but continue to work as a volunteer or participate with several organizations including Sons of Norway, Daughters of Norway, the National Nordic Museum, and Western Rosemalers' Association as well as my church. I have served in the capacity of president, vice-president, cultural director, social director, foundation director, editor, advisory board member and docent for various organizations. We purchased the cabin because we loved to ski, and soon discovered that we loved Tahoe in the summer, spring and fall as well as in the winter. The cabin was a great home base for exploring the many interesting areas in the Sierra Nevada. We became very attached to our little neighborhood, and even spent three years there between living in San Francisco and Idaho. We love the Westshore of Lake Tahoe. We like the sense of community there. Homewood Mountain Resort is our favorite place to ski. We can walk to cross-country tracks in Sugar Pine Point State Park. We love to walk to the Ehrman Mansion there. We also like the stream profile at D.L. Bliss State Park. The Vikingsholm at the end of Emerald Bay and Valhalla are also favorite places. You'll notice a little influence of my Norwegian and Swedish heritage at our cabin! Every year we strive to make some improvements in addition to annual maintenance. In 2016 we replaced a wooden step onto the front deck with a concrete one and also added a ramp. We put in new lighting and cabinets in both bathrooms. In 2017 we added a remotely programmable thermostat so that guests arriving during the winter will enter a warm home. In 2018 we added a socket below the picture window in the living room that has two USB ports in it so you can charge your phone. We also added a flat screen Smart TV along with the DVD and VCR player that were there. One of our summer guests added two new beach chairs for us. Our cabin is cozy and comfortable. What I love about our cabin is the wonderful smell of the forest, the lovely summer temperatures, the easy walk to the lake or to Sugar Pine Point State Park, the lack of traffic on the West Shore, the short trip to Homewood Mountain Resort, walking to our local market to pick up the Sunday paper and some milk, eating breakfast on the front deck and watching the world go by, walking the dog around the neighborhood and talking to all the neighbors, watching old movies (there are more than 500 of them there), taking friends along or inviting California friends to come up while we are there, the great room concept where I can cook and visit with guests at the same time, the summer festivals, Snowfest in the winter, driving around Emerald Bay, poking around the Vikingsholm and Valhalla, the stream profile and nature walks at DL Bliss State Park, hiking up to the tarns above Emerald Bay, going to the hot springs in Nevada, the quiet fall season when the salmon are running. And the skiing in winter is great! We have fabulous views of the lake from Homewood Mountain Resort. The beauty of the lake and the mountains always restores my soul! toilet, shower, Mirrored cabinet holds your toiletries. Bright lighting. toilet, combination tub/shower, Mirrored cabinet holds your toiletries. Bright lighting. Both bathrooms have identical lighting and mirrored cabinets above the sink. Towels are stored on shelves next to the cabinet. The entire Tahoe Basin is a summer resort, and there are many ski resorts in the basin for winter sports. There are also several state parks along the Westshore. The cabin in located in a forested area within walking distance of Lake Tahoe, and a bus route that runs along Highway 89 on the Westshore to Tahoe City and beyond north and also south. Tacoma is a small community with a few stores near the highway, access to the lake, a community park with a play structure, BBQ pits, an outdoor theater with movies and music programs, picnic tables. Lake Tahoe is a quarter mile from the cabin. Our homeowners' beach has a pier, swim area, and sand. There is no parking at the beach, so plan to walk. The Truckee River runs into Lake Tahoe at Tahoe City. Tubing on the Truckee is a popular summer pass time. Tubes are for rent along the river near Tahoe City. 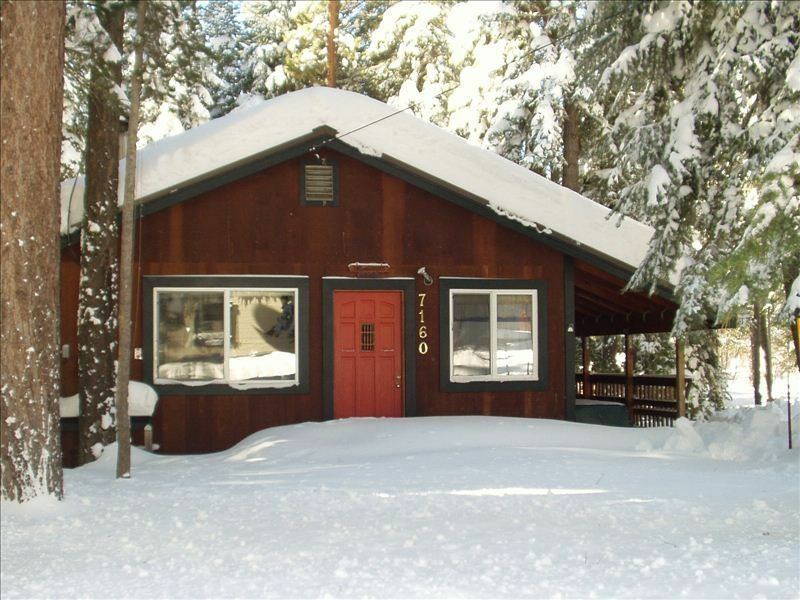 Our cabin is located in a subdivision that is adjacent to Sugar Pine Point State Park which has cross-country ski trails. You can ski to the tracks from the cabin. Our subdivision is adjacent to Sugar Pine Point State Park which has cross-country ski trails. You can ski to the tracks from the cabin. There is also a shuttle to Homewood Mountain Resort. Forced air furnace. Remotely controlled thermostat. Wood-burning stove and plenty of firewood. Sheets and pillow cases are located in the bedrooms. Front loading, stacked, in the side entry way. No street parking from Nov. 1 - May 1 for snow removal. There is plenty of street parking in the summer. Driveway accommodates 4 cars in summer, 2 in winter. Towels are on shelves in the bathrooms. There is plenty of firewood in the wood bin on the deck. Great room combines living room, kitchen and dining area. Top freezer, has ice trays. Spices and some basics like salt, sugar and oil. Everything you need to fix Thanksgiving dinner! Table with benches seats 7 - 3 on each side and one child on the end. If you need additional seating, there is a card table in the front bedroom closet, 2 yellow chairs and 2 folding chairs also. Stereo sound system is combination radio, CD and tape casette player. Speakers are mounted high on the wall for best sound balance. and VCR player are attached to the Smart TV. In the middle bedroom bookcase, including guidebooks to wildflowers, trees, birds and local trails as well as Tahoe history. Cookbooks are in the cupboard in the kitchen next to the refrigerator. Board games are stored in a tub in the back bedroom closet and in the cabinet just inside the front door. In boxes on the shelf of the front bedroom closet. 500+ movies include many suitable for children, plus classics, Westerns, musicals. List sent on request. The cabin is in a forest. We own one lot on the north (driveway) side and two lots on the south side. On three sides. Back deck is fenced so kids and pets are safe. Both front and back decks have picnic tables in the summer. Wood bin is on the side deck. Can be rented at Meeks Bay Marina and several other sites. Homewood Mountain Resort is 3 miles north of Tahoma. Wonderful views, great prices, good with kids. There are many other ski areas in the Tahoe Basin as well. Nearest course is in Tahoe City. Flat screen Smart 43 inch tv with WiFi available, and with a VCR and DVD player attached. Sound system CD and MP3 player hookup and radio, waffle iron, electric frying pan, crock pot, electric mixers (table and hand), blender, coffee maker, popcorn machine, cooking utensils, linens & towels, picnic tables and benches, lawn chairs, sewing kit, first-aid kit.